What is Candlemas—and who is making the tamales this year? Catholics throughout Mexico and in many churches in the United States will be coming to church this Saturday with extra company: a statue of el Niño Dios, the Child Jesus. The feast of the Presentation of the Lord, or Candlemas, is celebrated on Feb. 2, 40 days after Christmas. 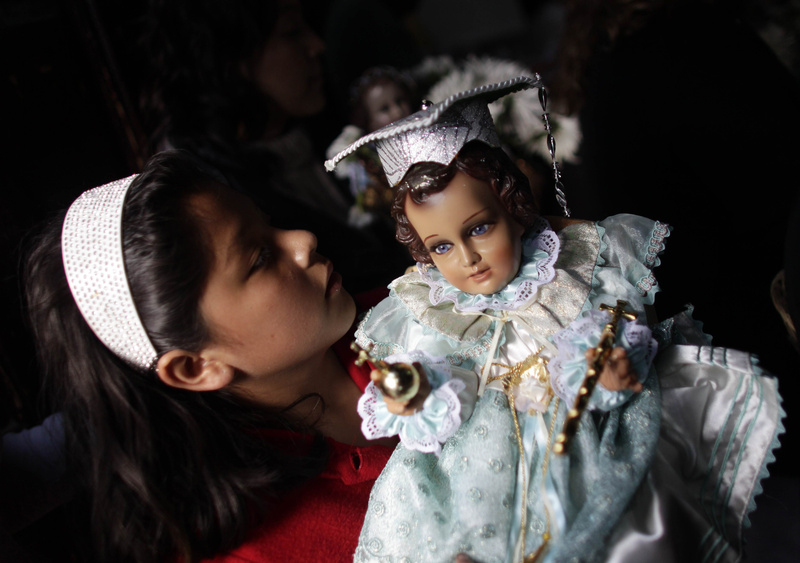 Mexican Catholics commemorate the day Mary and Joseph presented the Lord in the temple by bringing statues of the Child Jesus. In some regions, they dress the statue in different attire, often in a knitted garment. Patty Romero Hamrick, a Spanish-language teacher at St. Timothy Catholic School in Mesa, Ariz., said that in Oaxaca, where she is from, el Día de la Candelaria is also remembered as the Purification of the Virgin Mary. In addition to el Niño Dios, Catholics also process with statutes of the Blessed Mother, pray the rosary and attend Mass. These traditions take place in parishes across the United States as well, Ms. Hamrick said, most often in churches with large Hispanic congregations. Ernesto Vega, a coordinator for adult faith formation for the Archdiocese of Los Angeles, said the Candlemas is intimately connected to the Epiphany, the Three Kings celebration. In Michuacan, where he grew up, children would receive gifts from the Three Kings on Jan. 6, not from Santa Claus on Dec. 25. In the evening, they would eat the Rosca de Reyes, or Kings Cake. A little figure of the Baby Jesus is baked into the cake, Mr. Vega said, hidden to recall how the Holy Family had to flee King Herod. The person who finds the baby Jesus in his or her slice is responsible for making the tamales on Feb. 2. In larger communities, cakes have more than one Baby Jesus figure in the cake so there will be more help for the Feb. 2 celebration. For Mexican Catholics, Feb. 2 closes out the Christmas season in a way, Mr. Vega explained. On Dec. 12, they celebrate Our Lady of Guadalupe. Posadas, which commemorate the Holy Family’s search for lodging, are celebrated leading up to Christmas. And then come Three Kings and Candlemas. Immigrants from Latin America are bringing that spirit of celebration, sharing and community to the United States, he said. Good to know about these traditions, and to be reminded of Candlemas. The liturgical calendar before 1969 may have needed revision, but when that took place there were losses as well as gains. Old-timers among us may remember not only the twelve days of Christmas between the Nativity and Epiphany, with perhaps traces of the Twelfth-Night celebration and "Little Christmas" among English-speakers (and Día de los Reyes in the Hispanic tradition) but also the long version of Christmastide, all forty days from Christmas Day to Candlemas. Nowadays the presentation of Jesus and the purification of Mary receive no attention, and Christmastide is cut short as we rush on to the baptism of Jesus and the beginning of ordinary time. We're almost approximating the secular custom: Christmas starting in early fall to maximize gift-shopping (obliterating Advent), then ended by December 26th. Touching also is the "Nunc dimittis" of this day. It made me smile to read about some positives in our Catholic Church. Thank you. The tradition of blessing candles on Candlemas Day seems to have disappeared as well. One parish I frequently went to Mass at in San Diego—the beautiful Immaculata on the campus of the University of San Diego—was keeping the custom alive, but I've not encountered it anywhere else. Jesus, Mary, and Joe - Pray for us. You should know how to write a critical essay! This will help your editor's career.